"What a pretty boat, with that nice stern and unusual rig: what is it?" We agree that the questionaire is right: everything about the boat is both pretty and practical. 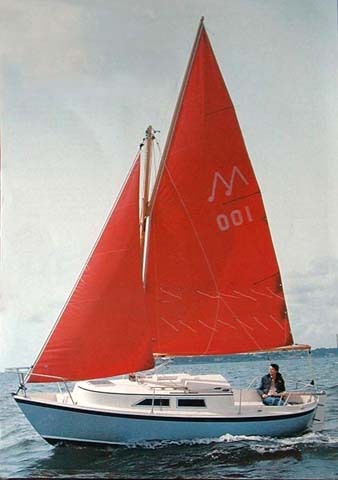 David Thomas developed the design for Hunter Boats in 1979, capitalising on his memories of the stern of a Royal Naval Montague Whaler and the best aspects of Gary Hoyt's American Freedom concept (hence the "Liberty" name) but anglicised so that conventional mast tracks could be used - and therefore a single sail instead of a wrap round - and the sail also reefed more efficiently as the complications of the wishbone and snotter are avoided. Life below decks is highly civilised because the main mast is so far forward that it does not interfere with the accommodation layout, while the offset main hatch allows a full sized heads compartment (with surprisingly good headroom) immediately to port. 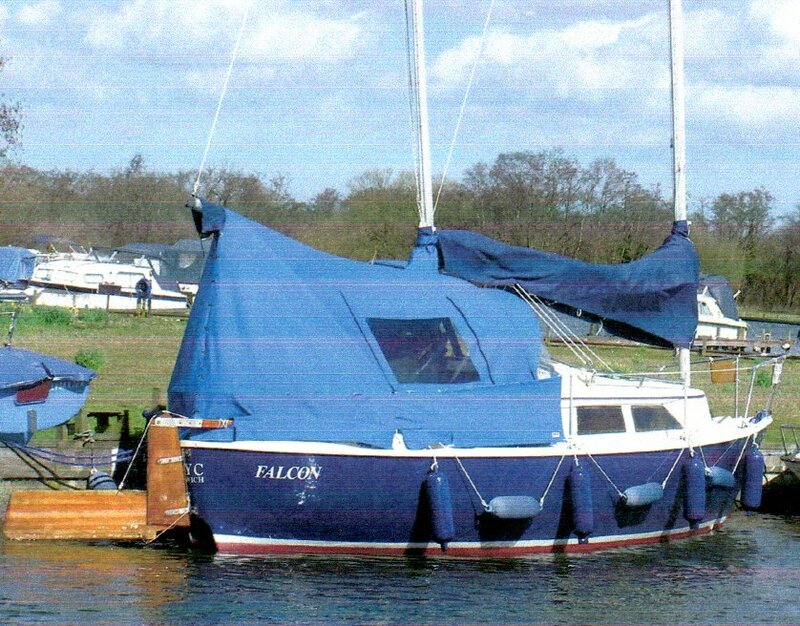 So the saloon allows a double or two singles, plus a very long quarter berth running back under the cockpit and a good galley. Altogether 84 Libertys were built: 65 22s and 19 23s (the same hull with more ballast, a slightly bigger rig and bigger, less attractive windows) and then Hunter Boats used the same hull to build 30 of the gaff rigged Minstrel class, which is equally popular; Liberty and Minstrel sailors delight in late evening discussions over the relative merits and speed of their boats. The Association boasts 87 members, so we still have to find about 30 of the boats, to document the whole class. If you happen to know of one, anywhere, we would like to know how we can contact the owner, so that we can try to discover its history, regardless of whether the owner wishes to join us or not. While the administrators and moderators of this website will attempt to remove or edit any generally objectionable material as quickly as possible, it is impossible to review every entry. Therefore you acknowledge that all posts made to this website express the views and opinions of the author and not the administrators, moderators or webmaster (except for posts by these people) and hence the HLMOA will not be held liable. You agree not to post any abusive, obscene, vulgar, slanderous, hateful, threatening, sexually-oriented or any other material that may violate any applicable laws. Doing so may lead to you being immediately and permanently banned. You agree that the webmaster, administrator and moderators of this website have the right to remove, edit, move or close any topic at any time should they see fit. Your Data: As a user you agree to any information you have entered above being stored in a database. Please note that your information will not be made available to non-members apart from specific areas such as wanted or for sale items. Whilst this information will not be disclosed to any third party without your consent the webmaster, administrator and moderators cannot be held responsible for any hacking attempt that may lead to the data being compromised. You can change your profile at any time. Should you wish to have your data removed from the site please inform the association. You should take note that this Association takes no responsibility for our Members' advertisements. Neither does it confer any guarantees regarding the items for sale. We are here only to provide a contact point and cannot provide advice on any item. Please contact the advertiser directly if you need further details. Hunter Liberty 23 “Falcon”, dark blue hull no. 77, built 1985. “Falcon” is in excellent condition complete with 4-wheel Hayling trolley/road trailer combination with manual & electric winches, ramps and spare wheel. Lewmar Delta 10kg bower anchor with 20m 26mm galvanised chain and 30m multiplait (2012), kedge anchor with galvanised chain and multiplait. 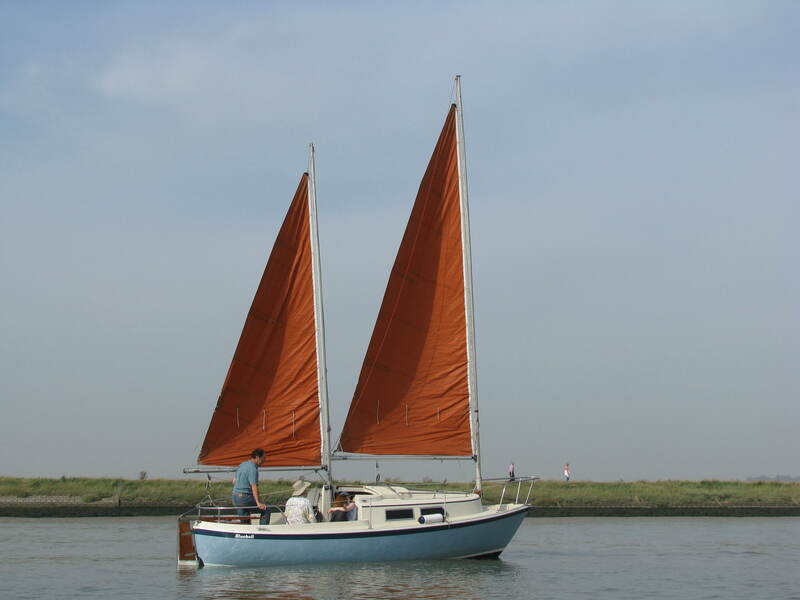 Stiffened masts, good main & mizzen sails with reefing lines to cockpit (2000/1996), Jeckells sail covers (1996), Jeckells spray hood and dodgers (1996, cleaned/proofed 2006), Jeckells full cockpit tent (2006). 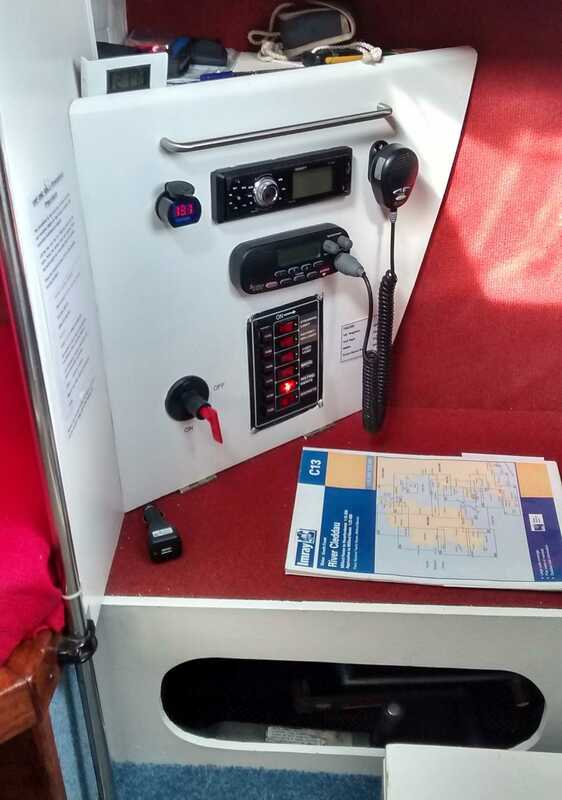 Cobra Marine DSC/VHF radio (2010), in-cabin FM/USB stereo (2014), Garmin 126 GPS (2010), Simrad Tillerpilot (2009), NASA depth sounder, NASA log (2014). With 240v shore power system, anchor light, flare pack, Plastimo Contest 101 compass, rescue buoy, stern ladder, blue fenders (8) with rope grips, 3 multiplait mooring lines. Thetford Porta Potti in separate heads compartment. 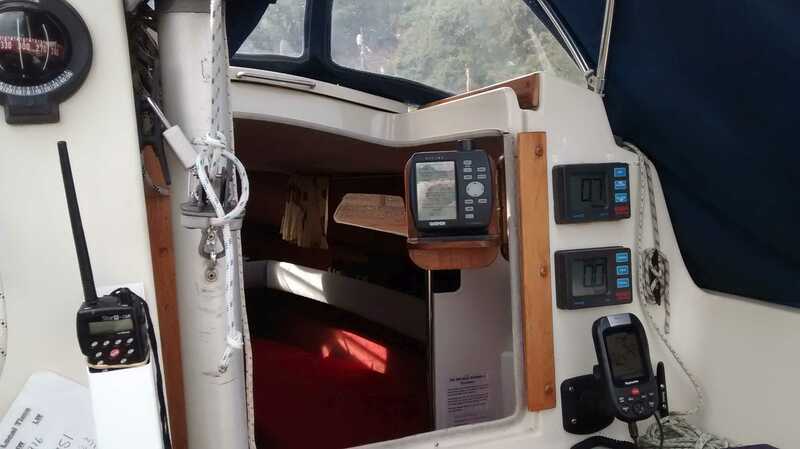 Excellent condition Mercury 4S Saildrive (2006) with charging circuit and remote tank. Solar panel, 12v battery. Contact Geoff Kite, 01352 741 625, geoffreyk30@gmail.com, for full spec. Hunter Liberty 23 with road trailer and spare wheel. Hunter Liberty 23 with RM road trailer. Built 1986. Engine a Honda 2.3hp, fourstroke, longshaft which is a few years old but has not been driven for more than 10 hours from new. A full inventory including a Tilley Talisman 2 ring gas hob, Jabsco sea toilet, mooring lines, fenders, anchor and chain, depth sounder, wind speed indicator, Garmin gps, Simrad Tiller Pilot, a magnificent 15cm diameter magnetic compass, VHF radio, boat hook, barometer, clock, nav. lights, fuel tanks, pick up bouy, loads of miscellaneous sailing items. Antifouled a few weeks ago. Ashore on its RM trailer (built specially for this boat) and stored in a locked compound at Rhos on Sea, North Wales. Further photographs can be forwarded. 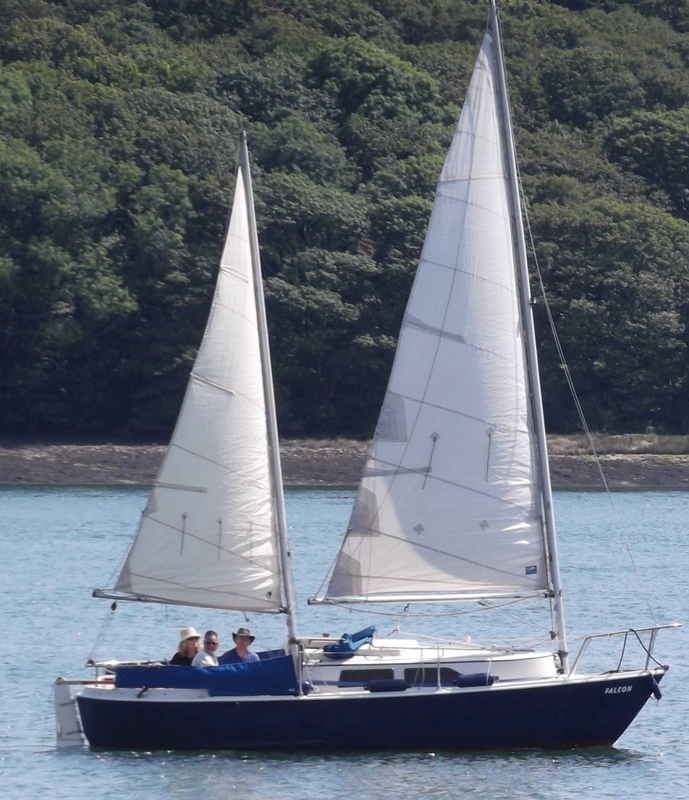 Sailed by me with friends and family along North Wales coast and Anglesey. Hauled out and laid up ashore every Winter.